Got some good air holes for a 100% rye sourdough too. The top photo looks like a pillow. Lovely result, Mary! I like the evenly cooked rye crumb. 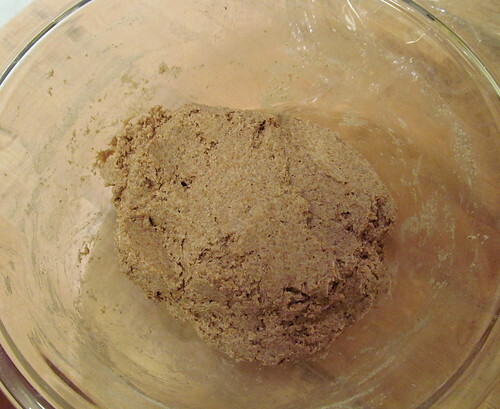 I often add 1 teaspoon of instant yeast to a 1.7 - 2 kg rye dough. I haven't bought the book, but I had a peek on amazon and it does look enjoyable. I think a bit of instant yeast would definitely help. The book was a nice fun read and I highly recommend it. seems to bring out the want to bake rye bread. From the look of the risen loaf vs the size it went in the pan and the lack of cracks in flour on the top of the proofed loaf, I would think that the 3 hr proof could easily have been 5-6 hours if you weren't watching the clock:-) I think the denser bottom could have been cured with a longer proof. Your rye looks just like mine did and for a first shot.,.... nicely done. I love high % rye bread because it is a hand mix, dump the paste in the pan, wait for the top bran or rye flour to crack and in the oven it goes. Tremendous flavor and bread for almost no work at all! Mini Oven, Andy and Phil teach all the tricks of rye bread baking and the reading of their posts is a wonderful trip down the rye bpaste lane. 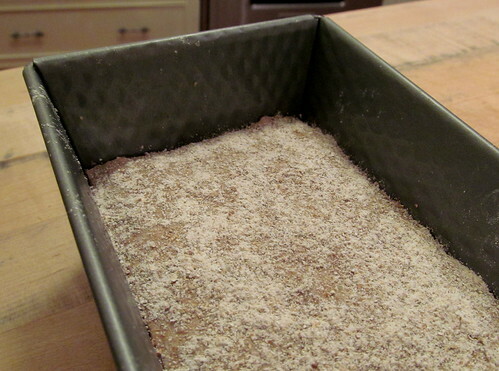 Phil's tip, cover the top with rye flour or bran and when it cracks it it ready for the oven. 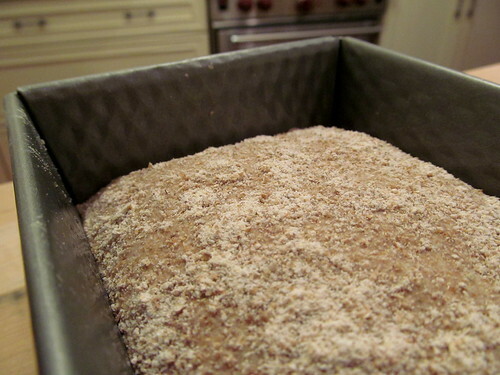 One of Mini's tips - after dropping the paste in the pan, shape the top with a spatula by lowering the sides against the pan and doming the middle of the loaf so the finished loaf doesn't look like the brick it is:-) - not to mention her 1: 3.5: 4.16 ratio of starter , water and flour. Mini also likes to fill the pan 75% dull and jet the dough rise above the rim. Tip from Lucy, if you want to really open the crumb and lighten the brickishness, cut the rye sour down to 25% and add a 10% yeast water levain to the mix (instead of Khalid's commercial yeast kicker which should do the same thing). I personally think a 15-20% rye sour preferment is plenty. i can't do it like Mini at all but ....perhaps you will ! You are off to a great start.. Happy Rye SD baking Mary! Or something along the same lines. Once holes start peering on the top get it into the oven. You don't want too many holes but the presence of one or two tells you it's the perfect time to bake. Anymore it'll overproof. I agree that it was under proofed since I didn't get the cracks in the flour and my volume increase was minimal. I gambled and went ahead with the bake anyway, but next time I will wait for the cracks. I don't know what would be worse. 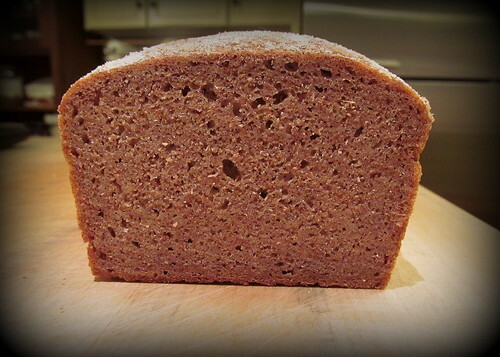 Rye bread that is underproofed or overproofed? I have yet to try Mini's 104% hydration loaf, but it's definitely on my to-do list. I got for underproofed rather than overproofed. It's pretty bad when you build a dome on the top and then end up with a concave one!" Done that a couple of times:-) Lucy says more but she exaggerates! Very nice loaf Mary. Looks delicious! At one time or another I'm sure every bread geek wishes that they can go on bread journey like SF writes in his book. But it was nice to live vicariously through him! Very nice Mary. Sorry you missed out on the rye testing as you would have enjoyed it. Your bread looks wonderful. I'm hoping my group gets a 100% rye to bake. Here's some irony for you-- I got in the test by the skin of my teeth because MY reply to Stan went into HIS spam folder. I'm going to taste test some of my ryes from Stan by running them past my Polish mother in law and her daughters this weekend when 3 of the four siblings get together for a big pierogi, kielbasa, and cabbage roll feed. And you've inspired me to try it again. sorry you didn't get to test Stan's ryes, yours does look excellent though! It is definitely that time of the year when a good warming rye is just the thing! I'm hoping Santa might bring me SF's book, I've leafed through it and am really looking forward to trying some of his breads...and reading his adventures. How to adjust for warmer room temperature? "let it ferment at room temp for about 18 hours," at what temperature was this 18 hour ferment? My parent's house is quite warm just want to figure out how to adjust! Thank you!! !